A visit to Northern Michigan is not complete without a walk along the Lake Michigan in search of Petoskey stones. The Petoskey stone is the fossilized remains of a type of colony coral that lived during the Devonian Period (about 350 million years ago). Northern Michigan was covered with a shallow marine sea, which favored the growth of many types of coral. Each cell represents a tube in which a small animal lived, waving its tentacles to secure food. The "eye" is actually a mouth of the animal. The city of Petoskey was named after Ottawa Indian Chief, Chief Pet-O-Sega. "Pet-O-Sega" means the "Rays of the Rising Sun." The eye of the stone is seen as the sun, and the lines or tentacles are seen as the sun, and the lines or tentacles are seen as the rays radiating from the sun. The stone was named Petoskey because of the abundance of them found on the shores of Little Traverse Bay. 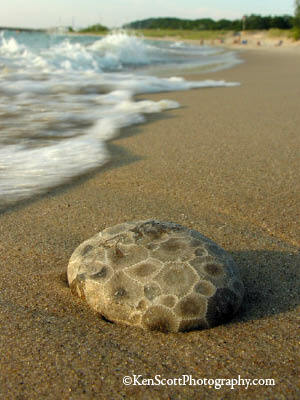 The State of Michigan adopted the Petoskey stone as Michigan's state stone in 1865. Petoskey stones crop up in many locations including fields and stone quarries but the favorite hunting ground has always been the area beaches. Wherever there are rocky shorelines from Petoskey to Traverse City, the stones can be found although most serious stone hunters swear that the Petoskey area has the better selection. In the late 1990s, the largest Petoskey Stone yet discovered, a one-ton monolith, was found by an amateur fossil hunter at Sleeping Bear Dunes National Lakeshore (outside of Traverse City). Pleistocene glaciers (about two million years ago) plucked Petoskey stones from the bedrock and spread them throughout what is now Michigan and surrounding areas which explains why Petoskey stones can be found in gravel pits and along beaches far from the Petoskey area. 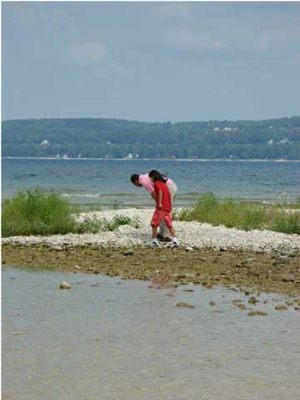 The Petoskey State Park is a favorite "stone picking" spot as it has many miles of beachfront and its location on Little Traverse Bay seems to bring the rocks to the shoreline. Boats can often be seen just off of the beach of the Petoskey State Park anchored in shallow water while the passengers dive for rocks. When dry, the rocks are gray in color but when wet (as in surf or light rain), the "eyes" of the fossils magically appear. It is the eyes that make the stone so identifiable. Polishing the rock involves several steps. A rough "skinning" takes place first using a 100 grit wheel, sand paper, or wet emery paper. Next, the stone is smoothed with a 220 grit wheel or paper. The final paper or wheel, 600 grit, takes the stone to a scratch-free surface. A final buffing compound gives the high gloss people have come to expect in a polished stone. Some rock collectors "cheat" by using a coat of lacquer on the stone to bring out the sheen without the fine polishing. Many homes and cottages in the northland have displays of Petoskey stones in a jar or vase of mineral water. This keeps the rocks in their natural state. Petoskey stones are a treasure that is distinctive to our part of Michigan. Pick up a bucket and head to the beach for a fun filled hunt for the Petoskey stone! If you would like a copy of the Petoskey stone photo on this page, please contact Ken Scott Photography. Also see www.LakeMichiganSandDunes.com for more about our Northern Michigan lakeshore!